Green drinking themed badge. 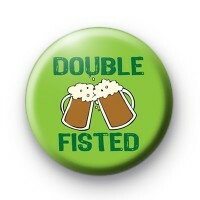 This bold green badge is 1 inch in size and has 2 big glasses of beer and the words double fisted written in a dark green font. It is ideal if you have a St Patricks day party or stag night planned and need a few funny badges to use as keepsakes from your celebrations. Our badges are a fun way to get everyone in the party spirit and we have so many funny alcohol, drinking and party themed badges to pick from. Many of themed are Irish themed. All our badges are handmade in the UK by us!